First off, I know that social media can be a overwhelming for a lot of authors, and I've seen several burn out in an attempt to have a presence across ALL the various social media platforms. My usual advice is to pick one or two to do well rather than attempt to do all of them, so if Facebook isn't your speed, there is no shame in letting it languish a bit while you focus on your Twitter and Instagram game instead. That said, a lot of authors tend to give up early on Facebook. I see a lot of "Facebook hides your posts so it isn't worth it... I post to my page all the time but only like 10% of my audience actually sees it in their feeds... I get no sales from Facebook... It's better to have a personal profile than a business page." And there is some truth to Facebook being really annoying at times. Facebook is a business, and if they consider you a business, they want you to pay to reach your followers. They want you to use their ads (which a lot of people swear by but I'm not an expert and that isn't the subject of this post). They want you to "boost" your posts. Now the page vs personal profile is a big debate. I'm honestly strongly on the side of page (I detail why in this post), but that's not the topic of this post, and I'm going to be talking purely about pages here, not personal profiles. It is very possible to train Facebook's algorithms to show your posts to more of your followers without paying to boost or buying ads (not that you shouldn't be buying ads, but again, whole other post) ... and the way to do it is to train your followers. 1/1/18 ETA: Some Facebook algorithm changes have again made exposure a little harder in recent months, but still not impossible, and these tips still apply. Two new tools (groups and Facebook live) are now also strong ways to increase visibility, but rather than add them in as a footnote here, I will create a new post featuring them at a future date. 1. Learn what Facebook likes and doesn't like. Facebook has preferences. They like image and video posts more than they like text posts, for instance, and you can get a lot further simply by including an image along with your text post. They DON'T like anything that links off their site. In fact, they are extremely needy about it, and if you click a link on Facebook while on your mobile app, you get this whiny, "Are you sure you want to leave Facebook? Facebook loves you!" message slowing your progress. So if the majority of content you are posting to Facebook includes links off Facebook, Facebook will do a "nananana can't hear you" game and not show as many people those links. This includes things like links to your books on Amazon or your blog on whatever blogging platform you like to use. Just post the link but don't make this the majority of your posts. Make it a once in a while thing after you've already trained your followers to see your posts using the remaining seven steps. Facebook notices people's habits. 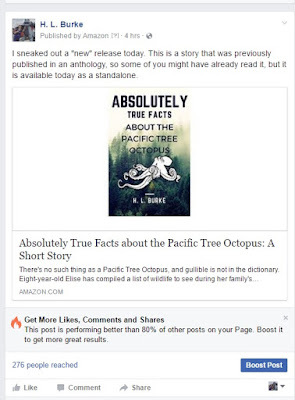 If someone clicks on your post, Facebook remembers it and is more likely to show them your next post. Because of this, the easiest way to get people to see your page is by providing them things they want to see with frequency. As a Fantasy author, I share a lot of dragon pictures (linking back to the artist and being careful about copyright law, of course, but that, again, is a whole other post. Just use common sense and don't steal pictures, all right?) and fantasy related memes. I chat pleasantly about stuff related to my process, things that inspire me, and sometimes my cat or my kids if they are being particularly hilarious. If you are a cozy mystery writer whose books have a food theme, recipes and food pictures might be your thing. If you write historical romance, period gowns and historical facts. Science fiction? Interesting tech and science news. Find what your readers like (here's a hint, if you are writing in a particular genre, there's a good chance what readers of that genre like is what you like) and give them that. Facebook shows people stuff that it thinks people want to see. 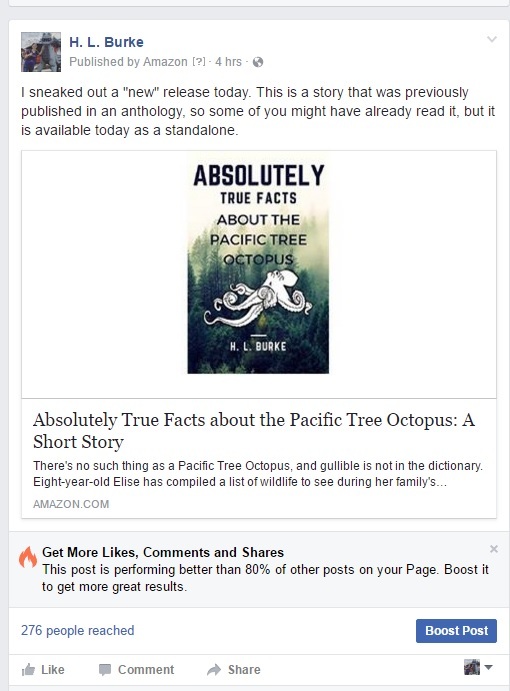 If you share one of your own posts (in a group related to the post's content or even on your personal page) it will be seen more than the same exact post if you didn't do that. It seems odd that Facebook would care about your sharing your own post, but for whatever reason, they do. On a similar note to item 3 on this list, posts that actively encourage like/share/comment will get more notice as people like share comment. You post, "Chocolate ice cream is my favorite!" you might get some likes. You post, "Chocolate ice cream is my favorite! What's yours?" you'll likely get likes and comments. Ask a question. Encourage your readers to talk about themselves. Shareable memes/jokes/images can also do this, but take a little bit more effort (a really great quote, a really funny joke, an image people just go "wow" over, those are your best bets.). 5. Take advantage of hashtags to invent a "daily feature" readers can look forward to and easily search out. Honestly, I am not sure WHY Facebook introduced hashtags, and I'd be leery of over using them. However connecting themed posts with a relevant hashtag does make it easier for readers to find a beloved daily feature. With my group's Fellowship of Fantasy page we do #fantasticfind. Both hashtags provide something that when readers see it, they know what to expect, and if they search for it, they can find even more awesome. Similar to #2 on this list, #6 is all about providing stuff people want to see. If all you are sharing are sales posts or "HAPPY DAY! I got a new review" posts or "It is so hard to be an author ... authory author sadness" stuff, the readers will tune out. Give them things that they can relate to. A little bit of author humor isn't bad. Some of my best received posts have involved some of the silliness authors go through in an attempt to create a readable project. However, a lot of authors seem to use their Facebook pages as personal "support groups" where they post a lot of humble brag "I can't believe someone gave me this review on my new book. I feel so flattered and special" sort of things for back pats and/or comfort when things go poorly. Try to make your page about your readers, not about you. I know that seems odd considering it is your page, but it is also essentially your store front. Imagine you went into a coffee shop for a coffee and to get to it you had to listen to the barista unload all her day to day struggles on you? Yeah, it's kind of like that. 7. Provide exclusive content that they either get first ... or are the only ones to get. Another trick is to provide exclusive content. I mentioned above how Facebook does not prefer you to link off of Facebook, so if you write a blog post and link to it on your Facebook page, you might not get a lot of views. If you post a video to Youtube then link to it, also maybe not seen by as many folks as you'd like ... some writers try to fix this by essentially copy pasting/uploading the same content onto multiple social media streams. It can work for a while, but if you have readers who are following you on more than one platform, they are going to start tuning out the repeated information and maybe unfollow you in one or more places. Things like providing "fun quotes" from your book as you write can get them excited and also provide a reason for them to follow you there as opposed to just on your blog or Twitter (Facebook has an advantage over Twitter in length. You can share lines on Twitter, but I often share decently long "sneak peeks" on Facebook and they often get decent response). It's easy to get caught up in the number of Facebook followers you have, but honestly, it is better to have 10 followers who are excited about you than 10,000 who clicked like and then never came back to your page ever again. Because of this, I really recommend concentrating on "real" followers. Resist the urge to join "You like my page, I'll like yours" follow chains in author groups. If you make a giveaway in an attempt to attract new followers, try to make it a prize that appeals to your reader base rather than just something everyone and their grandmother wants, whether they like to read or not (books by a similar author, something on theme if you have a specific theme, like for me, Fantasy stuff). So those are my tips for making the most of Facebook and "beating" their algorithms. Do you have any suggestions? What sort of posts get the best interaction for you on Facebook? Oooh, excellent! Though the other day when I tried to post a link and a picture, my page told me I couldn't do that. Whaaat? And your #DailyDragon posts almost ALWAYS pop up on my newsfeed. hope it helps you navigate! FB is weird. This was super helpful, Heidi, thanks! 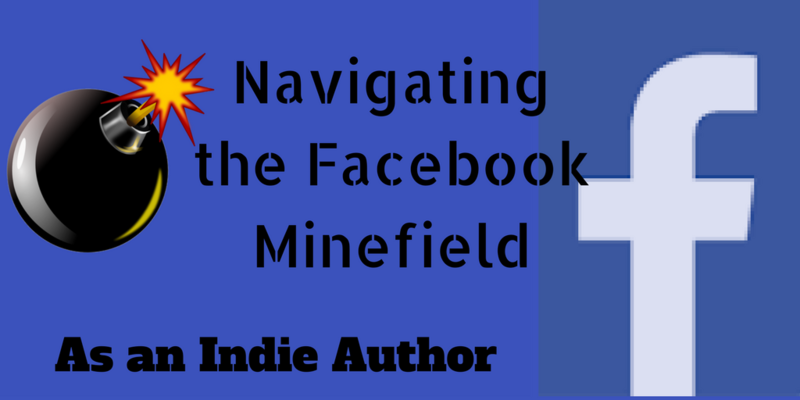 I've been trying to concentrate on figuring out FB before moving on to other SM platforms. It's definitely a learning curve since it has a mind of its own. Yeah, I probably need to learn twitter eventually. That's the one that overwhelms me. All of this rings so completely true! You are wise beyond your years!! !